Since writing about frying grape leaves crisp in the Crazy Salad post, I have become more and more interested in the range of flavors and textures produced by frying and toasting leaves. Grape leaves remain my favorites, because of the exquisite lemony-sorrel burst that follows the delicate crunch. Before you try cooking your leaves, please read the part of the Crazy Salad post that deals with selection of leaves. The short version is : chew up a piece of leaf from the exact vine that you are thinking of cooking. If it chews easily, proceed. If you are left chewing what feels like a bit of wet paper between your teeth, rethink or find another vine. That fibrous quality will not go away when cooked in any fashion. I have liked the leaves of my wine grape vines best. This is an easy and quick impromptu lunch or light dinner, vaguely Greek in its inspiration. Here I used a garnish of fried grape leaves and capers to add tang and herbaceous pizazz to a nice piece of black cod fillet. 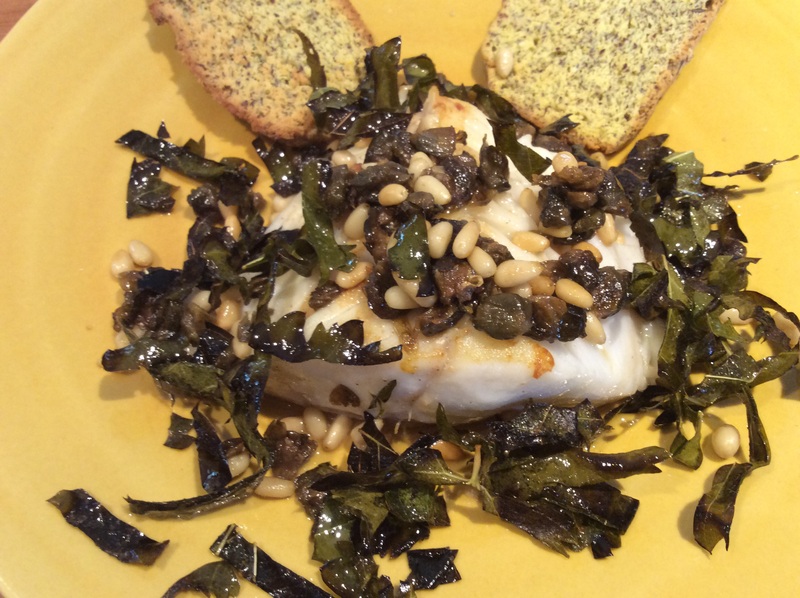 For each person eating, you need a 4-5 oz piece of Alaskan black cod fillet or salmon fillet, a handful of capers in salt, 5-6 fair-sized grape leaves, a clove of garlic, a small handful of lightly toasted pine nuts, a quarter of a lemon, salt, and 1-2 glugs of good olive oil. Prep: Rinse the capers of loose salt, soak them in cold water for about 20 minutes, drain, and squeeze them dry one handful at a time. Rinse the grape leaves, shake them dry, snip the stem away, and stack them up for quick slicing. Slice them crosswise into strips about 1/4 inch wide. Salt the fish pieces, not too heavily because the capers will still be quite salty. Chop the garlic. Cook: Heat a good nonstick skillet that can easily accommodate the fish pieces over medium heat. When it is hot, pour in 2 good glugs of olive oil. I would guess that this is about 2 tablespoons or a little less. Throw in one strip of grape leaf, and if it sizzles and changes color and crisps in several seconds but doesn’t burn, you are good to go. Otherwise, fiddle with the heat and try again. 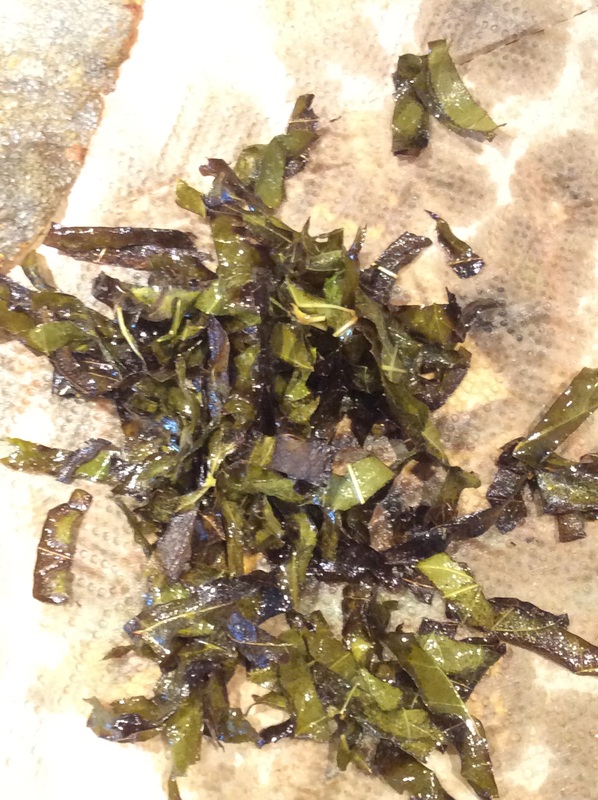 When the heat is right, toss in the grape leaf strips and stir-fry rapidly until they have all changed color and crisped and there are browned but not blackened spots. Scoop them out onto a paper towel to drain. Check crispness. Limp leaves will not give the right effect. Set them aside. Wipe out the pan quickly, heat it again, put in the same amount of olive oil again, and add the chopped garlic and the capers. 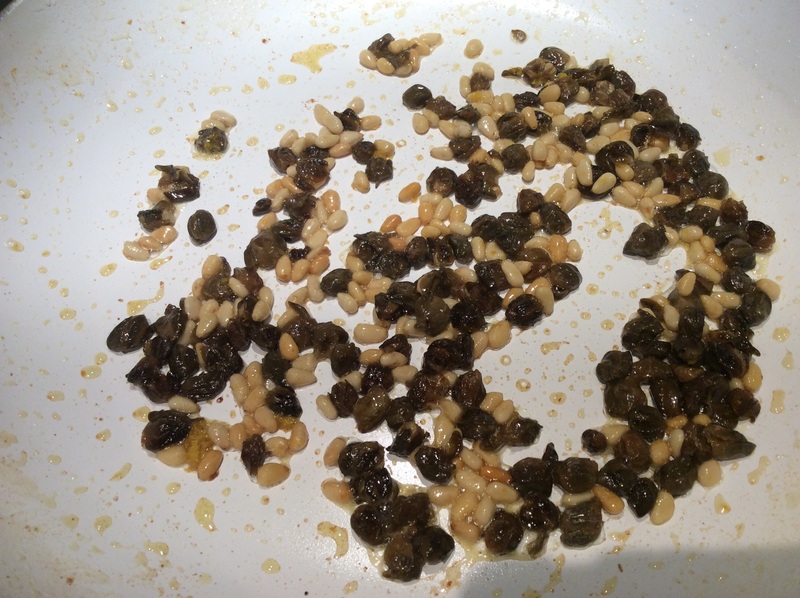 Sauté until the garlic is cooked but not browned at all and the capers have darkened a bit. You aren’t going for crisp this time because it would burn the garlic. When the garlic looks cooked, squeeze in the lemon juice and add the pine nuts. Cook a couple of minutes more and pour out into a bowl. Reheat the pan, add a touch more olive oil, and put the fish fillets in skinless side down and cook over medium-high heat until they color an attractive gold in spots. Now turn skin side down and cook to your preferred degree of doneness. Personally, I like salmon medium-rare but black cod cooked until it flakes. Plate the fish, put the caper mixture over the top of each, and finally top with lavish drifts of fried grape leaves. This is a good healthy dish for ketogenic and low-carb dieters and Paleo dieters, as well as for everyone else.